When Joel (Santino Fortana) - the unlikely heir to a Mexican fast food franchise - reluctantly accepts a mission to find new menu ideas in New Mexico, he finds himself in a small, dusty town where foodies travel from great distances to salivate over the culinary treats of local, authentic and feisty female chef, Javiera (Dania Ramirez). 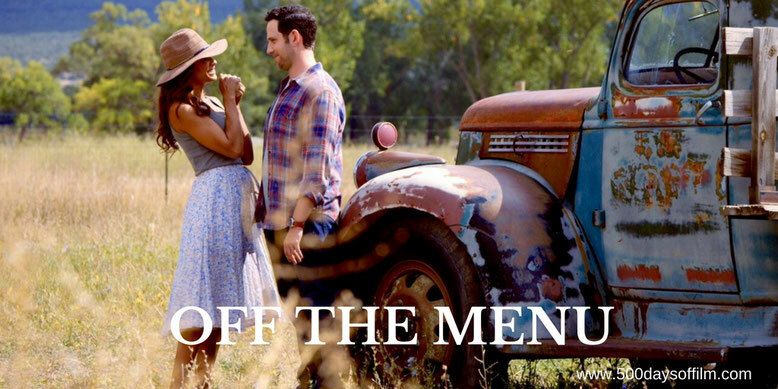 Off The Menu is a charming romantic comedy about life, love and the transformative power of food. Jay Silverman’s film is funny, unashamedly sweet and mouthwateringly delicious to watch. We meet Joel and Javiera as they search for purpose and meaning. Joel’s sterile existence (emphasised by the film’s icy cold tones) has left him unfulfilled and self-obsessed. He sees food purely as fuel and hates Mexican cuisine. Meanwhile, in the colourful warmth of New Mexico, Javiera wishes for someone to share her life and her fabulous cooking. For Javiera, food means family and community - cooking is an expression of love. There will be no prizes for guessing what happens next. However, that is perfectly fine - the enjoyment of Off The Menu is in the journey not the destination. It is in the film’s warm ensemble cast, it is in Santino Fontana’s brilliantly engaging portrayal of Joel (we like him even when he is at his most objectionable) and it is in Dania Ramirez passionate performance of Javiera. Meanwhile, Off The Menu is also interested in exploring our relationship with food. Inspired by Michael Pollan’s novel The Omnivore’s Dilemma, Silverman wanted to make a movie that explored “how huge a role that food plays in all our lives”. For Joel and his sister, Stacey (well played by Kristen Dalton), food is a business - the quicker it is to make, the cheaper it is to buy the better. The parallels in today’s society are easy to see. It is only when Joel meets Javiera that he realises the importance and power of food and how it can bring people together. Off The Menu is charming, funny and romantic - a film that will have you reaching for your recipe books. Have you seen Off The Menu? If you have, what did you think of this film? Let me know in the comments section below or via Facebook or Twitter (@500DaysOfFilm). I just watched the DVD last night with a couple of friends. We couldn’t agree more! SO refreshing to come across a film that inspires love!!! I was inspired by the LOVE STORY, THE FOOD, and THE FOOD! I watch it again to be remanded that when LOVE is great so many things can be accomplished. Love . Family. Food. Very refreshing and delicious,colorful with women Minority in leading Roll ! We just watched Off the Menu on cable VOD. What a visual treat and a heartwarming story. Five stars! I watched Off the Menu because a friend had suggested it. This movie hooked me and kept me on the line through the end. I found myself holding my breath and tearing up at the end. This was a very talented cast with a fresh storyline. Mackenzie Moss (Sophia) was my favorite character. Great job everyone. I will be suggesting this to my friends.